FOX’s new series has some new company. 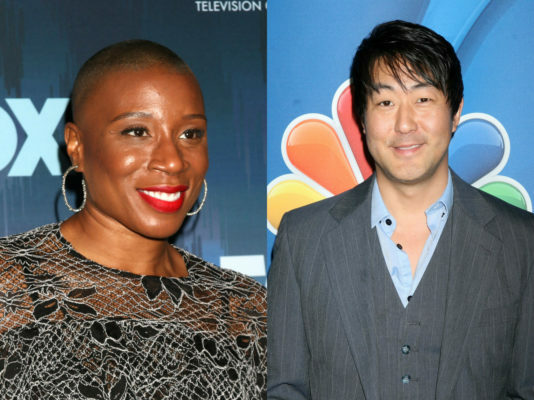 Recently, the network announced Aisha Hinds (pictured, left), Kenneth Choi (pictured, right), Rockmond Dunbar, and Oliver Stark have joined their upcoming TV show 9-1-1. From Ryan Murphy and Brad Falchuk, the drama “explores the high-pressure experiences of police, paramedics and firefighters who are thrust into the most frightening, shocking and heart-stopping situations.” The cast also includes Angela Bassett and Peter Krause. 9-1-1 is slated to debut on FOX in 2018. Oliver Stark (“Into The Badlands”), Aisha Hinds (“Shots Fired,” “Underground”), Kenneth Choi (“The People v. OJ Simpson: American Crime Story”) and Rockmond Dunbar (“Prison Break,” “The Path”) have been cast in series regular roles in FOX’s provocative new drama, 9-1-1, from creators Ryan Murphy, Brad Falchuk and Tim Minear. The series will premiere in 2018 on FOX. Academy and Emmy Award nominee Angela Bassett (“American Horror Story,” “What’s Love Got to Do with It”), Emmy Award and Golden Globe nominee Peter Krause (“The Catch,” “Six Feet Under”) and Emmy Award nominee Connie Britton (“Nashville,” “Friday Night Lights,” “American Horror Story”) star in the series, which explores the high-pressure experiences of police, paramedics and firefighters who are thrust into the most frightening, shocking and heart-stopping situations. These emergency responders must try to balance saving those who are at their most vulnerable with solving the problems in their own lives. Murphy, Falchuk and Minear are executive producers on the series, along with Bradley Buecker, Alexis Martin Woodall and Angela Bassett. Buecker directs the series premiere episode. British-born Oliver Stark most recently was seen in a starring role on the cable drama “Into The Badlands,” and in the feature film “Underworld: Blood Wars,” alongside Kate Beckinsale. Stark began his career at a young age attending the North London Performing Arts Centre. He made his first British television appearance on the BAFTA Award-winning BBC series “Casualty,” and followed with roles on the Golden Globe- and Emmy Award-winning series “Luther,” opposite Idris Elba; as well as in “Dracula,” alongside Jonathan Rhys Meyers. What do you think? Are you a fan of Ryan Murphy’s work? Will you watch 9-1-1? I love the show. Praying for another season. Enjoyed the first episode. Good variety of characters with excellent actors. Just enough different from other police/firefighter series. Like Connie Britton in this role.